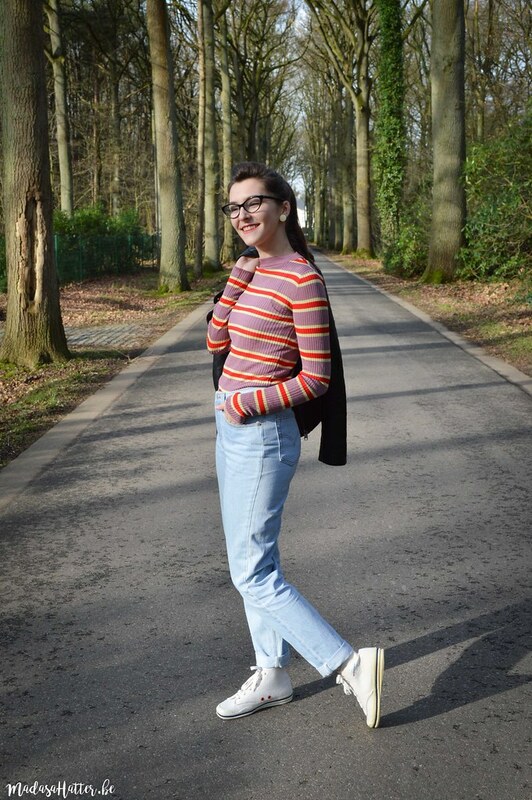 De outfit van vandaag bevat weer een mooie mix tussen nieuwe kledingstukken en vintage pareltjes: een rockabilly outfit met Vintage Levi’s en een wel heel kleurrijk solden-koopje van H&M! 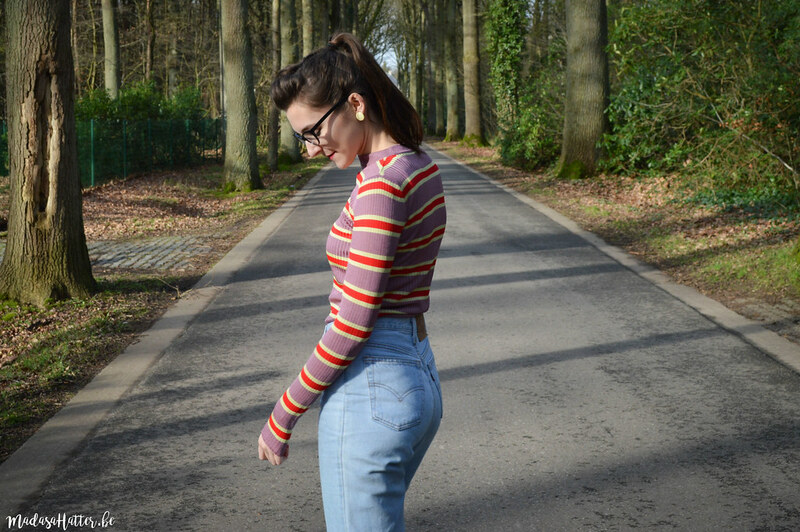 Today’s outfit features another fun mix between new items of clothing and amazing vintage finds: a rockabilly outfit with Vintage Levi’s and a very colourful sales buy from H&M! Ik hou wel van een beetje kleur in mijn outfits, maar dit kleurrijk gestreept truitje van H&M was toch een uitdaging om te combineren in een niet té opzichtige look. Ik kwam het tegen in de solden, en ik betaalde er amper €5 euro voor! Op het einde van de solden kan je bij H&M soms nog heel leuke stuks vinden die wat specialer zijn. 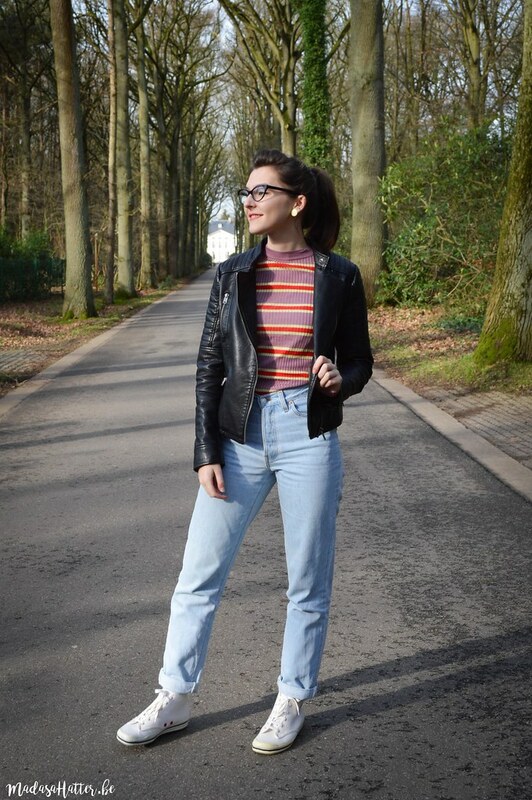 Ik combineerde het truitje met mijn light wash vintage Levi’s 501, en toen ik ook nog mijn vintage tennisschoenen aandeed en mijn leren vest toevoegde, zag de outfit er meteen al lekker rockabilly uit. Misschien kan ik dit truitje ook wel combineren met een effen kleurige wijde rok, maar mijn voorkeur gaat toch uit naar een sportieve outfit met een jeans. 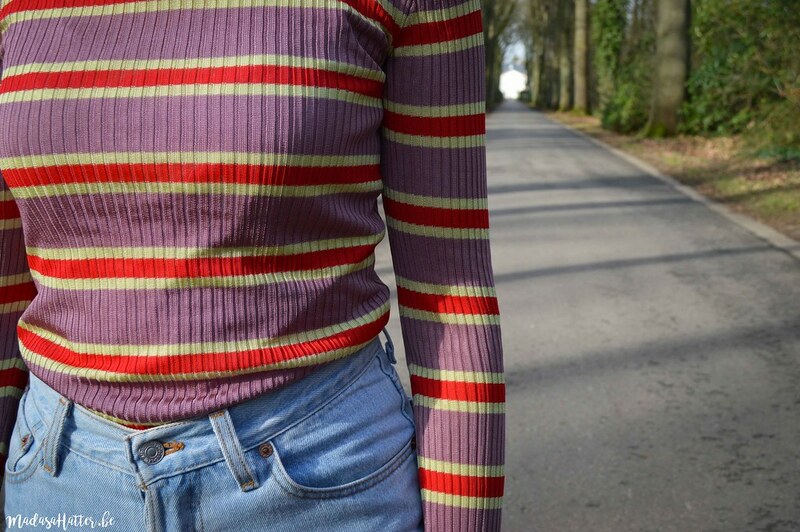 I like to add a bit of colour to my outfits, but this colourful striped shirt from H&M appeared to be a bit of challenge when I tried to create a look that wasn’t too loud and flashy. 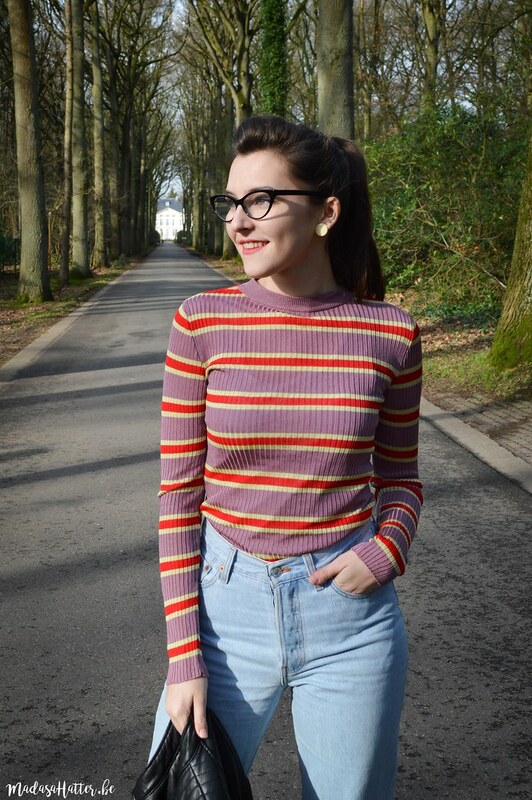 I came across this top in the sale, and I only payed €5 for it! At the end of the sales you really can find some amazing pieces at H&M that are a bit more unique. I combined the top with my light was vintage Levi’s 501 jeans, and when I added my vintage tennis shoes and leather jacket to the look, the whole outfit appeared a lot more rockabilly. I might be able to combine this top with a plain wide skirt, but I think I prefer how it looks with jeans to create a sporty look. The shoes have a fun story behind them: I bought them last year at a sports store that was doing a closing sale, and they are original (and unworn from 1970. I like to wear them with an outfit inspired by the 1950s, because they remind me of dancing shoes from that time. I only dare to wear them when the weather is nice, because they’re actually indoor sporting shoes and I don’t want to make them dirty immediately.